Would you like to discover the REAL Alaska and Yukon? Our 2019 escorted group tours, offer you the chance to get off the beaten track. 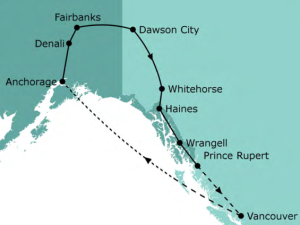 Rather than travelling on large cruise ships, our tours feature the Alaska Marine Highway ferries, which allow us to visit the smaller local communities on the Inside Passage. Join us on these small group tours to see black and brown bears up close at the famous AnAn Bear Observatory. In the morning fly from Vancouver to Anchorage. In the afternoon we enjoy an orientation tour of Alaska’s largest city. Today is at leisure. You might like to enjoy the Anchorage Museum and explore the downtown area. We join the Tundra Wilderness Tour taking us into the Denali National Park. Our tour provides an opportunity to view the magnificent scenery that makes this wilderness region so famous. During the tour we keep a close watch for wildlife such as bears, moose, wolves and caribou. In the morning we board the Riverboat Discovery for a cruise down the lovely Chena River. This tour includes a visit to a recreated Chena Indian Village and demonstration of dog sledding. The day is free to explore the town this national historic site. A base during the 19th -century Klondike Gold Rush, the town has beautifully preserved frontier style buildings. We venture up the Dempster Highway into spectacular Tombstone Territorial Park, which protects over 2100 square kilometers of rugged peaks, permafrost landforms and wildlife. We travel by water taxi to Skagway to explore this well preserved frontier town before taking a ride on the White Pass & Yukon Railroad. Built during the days of the Klondike Goldrush, this is one of the most interesting rail trips in North America. We can view glaciers, waterfalls and historic sites. We visit AnAn where we have the opportunity to safely photograph black and brown bears in the wild. We start the tour with a beautiful one hour boat trip to AnAn Creek. On arrival we walk through lush rainforest to the bear viewing platforms. We are accompanied by local guides throughout the tour. We take a jetboat ride through the lower reaches of the Stikine River. This pristine wilderness features glaciers and possible sightings of bears, moose and eagles. The day is free to explore the town including Petroglyph Beach, Rainbow Falls and the local museum. Day at leisure to explore the Cow Bay waterfront area. Fly to Vancouver where we board our flights back to Australia (international flights are not included. If you would like a quote for fares with Air New Zealand please contact us to discuss).